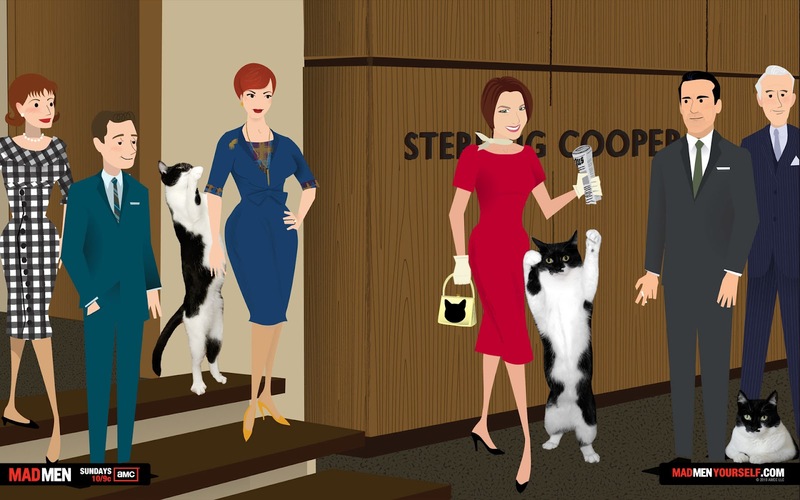 Glogirly's been watching the AMC television show called Mad Men lately. It's a drama about New York's prestigious ad agencies at the beginning of the 1960's. It features a bunch of sour, dramatic and often boring ad executives, all impeccably dressed and coifed, against a sleek midcentury modern backdrop. There's a special Mad Men website called 'Mad Men Yourself' that helps you build your own Mad Men avatar of your human. You can pick their hairstyle, outfit and all the accessories. You can even pick the background set. Once you've built your new MadMen cartoon human, you can download it to your computer or directly to Facebook. Mad Men characters L-R: Peggy, Pete (he's a jerk), Joan, Glogirly, Don Draper (the star) and Roger Sterling (the only one with a sense of humor.) That's me, the cat. So if you're feeling a little MadMen-ish, or MadCat-ish... just click HERE and you can make one for your human. Share it with us on Facebook too! The woman loves Mad Men so perhaps she will have to try it. Oh wow, my mom is hooked on the show too! We were hissed off at the episode a long time ago where a woofie didn't get treated well. We hissed at that episode....other than that, we tolerate her watching it. This whole thing sounds so flawed... the no cats thing, first off. And my human hates midcentury - she prefers 1920s for vintage. Why can't they make a show about 1920s, high-flying stock moguls? And include cats. My human would totally build an avatar for that. Our human watches it all the time even though we have protested loudly the lack of feline characters. We might let her try the link. What???? A show wifout a cat? And your hooman watches this? Why would anyone watch a show that doesn't have a cat? WE are the stars of ANY show, humans! I've never heard of the show but it can't be much of a show without a cat, now can it? love the graphic! I don't watch the show but should.....spent over 20 yrs in the ad world (but with newspapers which was different) so think I had my fill of it there! We didn't know the show but we are from the UK and maybe it hasn't been on here yet. No cats? How could that possibly be popular? Glogirly we love your madcat picture!!! I recently went to a birthday party which was a Madmen theme and we all had to dress in clothes of the time, it was a riot!!! Hmmm very interesting, thanks so much for sharing this hint! Glogirly is so charming, but you...YOU are a STAR! Don´t think we can seet that in Sweden yet. No cats on this show?? Yep, they definitely must be Mad Men! Mad to not have a cat on their show!! Cool graphic though and you look lovely as per usual Katie! We have never seen it but we are glad Glogirly got you in the picture Katie. Hollywood loves ad agencies as employment places for characters. The mom was production manager for several years at a couple agencies. She hasn't seen Mad Men, but she's yet to see a show that is really like working at an agency. Its really hard work and the grind of deadlines in unrelenting. She's sure glad she isn't doing that any more!